This short video highlights the strong leadership in Melbourne’s northern region in the prevention of violence against women. It features workplace leaders from the Building a Respectful Community Partnership talking about gender equitable strategies they’re using in their workplaces. This strategy works towards a gender equitable and non-violent community where women and girls are valued, respected and safe. Building A Respectful Community: Preventing Violence against Women in the North is our regional infographic clip. This conversation starter can be used as a resource for individuals and organisations working in the northern region of Melbourne to use and share. The final evaluation (March 2017) of the Building a Respectful Community – Preventing Violence against Women – A Strategy for the Northern Metropolitan Region of Melbourne 2011–2016 evaluates the value of our work and provides future recommendations. 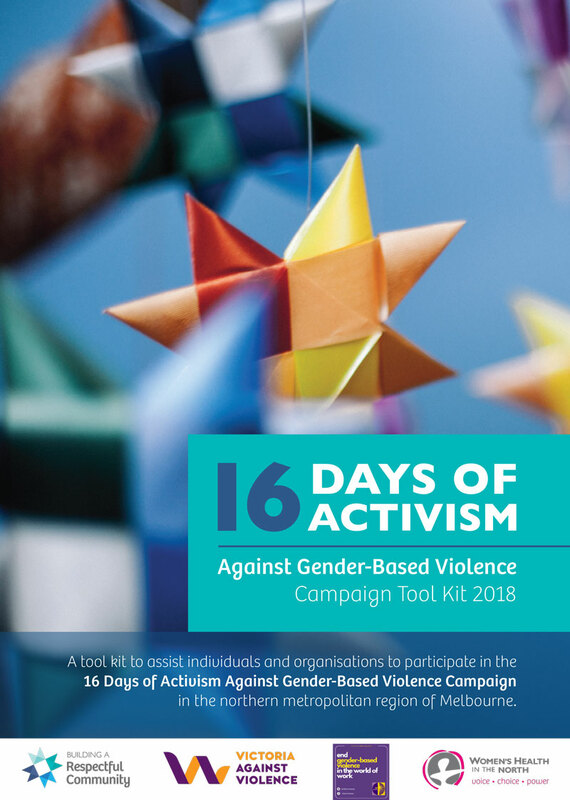 A tool kit to assist individuals and organisations to participate in the 16 Days Campaign in Melbourne’s northern metropolitan region. Preventing and Addressing Violence against Women Organisational Assessment Tool is a resource that takes a whole-of-organisation approach to preventing violence against women and outlines the key considerations for embedding this work. For Love or Money is a film that sets out to not only name and unpack ‘financial abuse’ as a form of violence against women but aims to open up dialogue about healthy financial relationships. The film supports the prevention of violence against women and promotes women’s financial security. Contact us for a copy of the DVD. The For Love or Money resource notes are an educational resource about financial abuse. The notes provide information and activities about relationships, money and financial abuse to support the For Love or Money DVD. Love Control is an educative short film about how to recognise abusive behaviour. These resource notes were created to accompany the Love Control DVD. They explore how to use the film in a variety of settings (such as in individual support, schools, community groups, mixed gender groups and staff capacity building), how to respond to questions created by the film, how to use the film to its maximum prevention potential, and ways to increase accessibility to prevention messages through using the Plain English version of the notes. To understand the work that underpins the resources on this page, visit the Preventing Violence against Women page in the ‘Current Work’ section of our website.